Maia McGuire, Florida Sea Grant agent with UF/IFAS Extension in St. Johns and Flagler counties, has been granted one of two Art Hornsby Distinguished Extension Professional and Enhancement awards for her work developing and implementing the Florida Microplastic Awareness Project. The award recognizes UF/IFAS Extension faculty members for creative contributions and outreach programs related to soil and water sciences. For her accomplishments, McGuire will receive $2,000 for program support, a $3,000 salary supplement and a commemorative certificate. She will be formally recognized at the Extension Professional Associations of Florida conference in Fort Myers on Aug. 31. The Florida Microplastic Awareness Project began in 2015 with a grant from the NOAA Marine Debris Program. 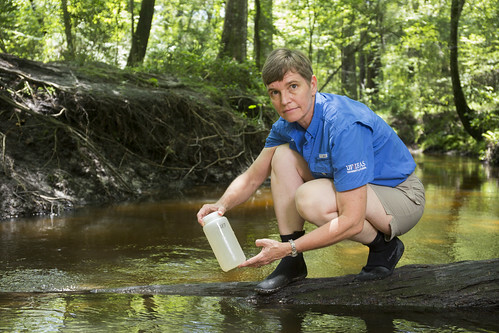 In the past two years, McGuire has trained hundreds of volunteers around the state to sample water for bits of plastic. All of the data have since been entered into a Google Maps database to show the concentration of these particles visually. Thus far, the education campaign has resulted in 1,200 people taking the pledge to reduce their use of single-use plastic. The structure of the program has also been duplicated by partners in the Mississippi-Alabama Sea Grant program. With this award, McGuire hopes to amp up the effort by participating in the 6th International Marine Debris Conference in San Diego. “I plan to put in a proposal to present, but am also hoping to take advantage of the opportunity to meet with other researchers and learn what’s currently being investigated in the marine debris and microplastics realm,” McGuire said. Ultimately, McGuire hopes this award is a step in the right direction toward reducing the amount of plastic in the ocean by getting people to think more critically about the disposable plastic they use.